The name Pataikos refers to a protective god (or perhaps a whole group of related gods) in the form of a dwarf. Representations of Pataikos appear on amulets worn around the neck. The god is usually depicted with a bald head on which a scarab can be seen. Sometimes he has a falcon's head. He is often standing on crocodiles and holding other dangerous animals such as snakes in his hands. As far as attributes and function are concerned, he may be compared to the god Horus as depicted on magical stelae from the Late Period. Pataikos appears frequently from the New Kingdom on, but similar figures from the Old Kingdom may perhaps already be depictions of the god. The name Pataikos was introduced by the Greek writer Herodotus. He relates that in the temple of Memphis there was a statue of the god Ptah in the form of a dwarf, an image so remarkable that it provoked the mockery of the Persian king Cambyses. 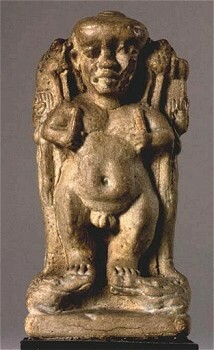 Herodotus compared the statue with a protective statuette in the shape of a dwarf that he knew from Phoenicia. He also records that Pataikos was regarded as the son of Ptah. We do indeed have representations of Pataikos from the Late Period whose texts identify him as Ptah or Ptah-Sokar. We also find Pataikos depicted together with Sakhmet or Nefertem, two gods who formed the triad of Memphis along with Ptah.